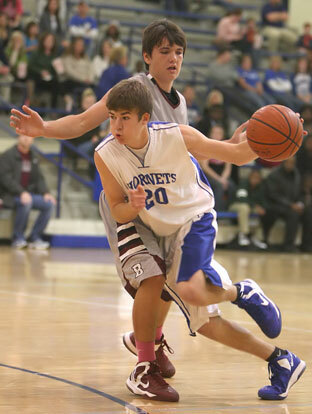 After a quarter of their Central Arkansas Junior High Conference opener against the rival Benton[more] Panthers, the Bryant Hornets freshman team trailed by just 3 points. But, to start the second period, Benton’s Cason Maertens scored 7 points in a row and the Hornets were never as close the rest of the game. It was a contest of streaks and runs. Though Benton was never really able to pull away without the Hornets rallying, the advantage never was less than 5 as the Panthers forged a 41-33 win. Maertens led all scorers with 18 points. Teammate Westin Riddick added 13. 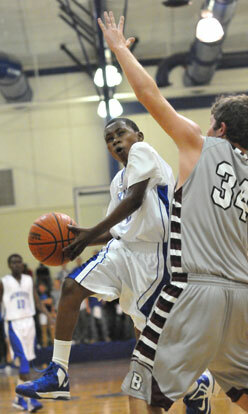 Bryant was paced by Cameron Murray, who scored 12 points inside and collected a game-high nine rebounds. Kris Croom added 10 but 6 of that came on a pair of late 3-pointers after the Panthers had pushed the lead to 12 in the final :30. Actually, the Hornets were able to whittle double-digit leads to 5 in both the third and fourth quarters. In fact, they were within 28-23 going into the final three minutes of the game. Riddick scored for the Panthers to bump the lead back to 7 then, over a 1:45 stretch starting at 2:23, the Hornets were sent to the line on four trips. With a chance to earn a maximum of 8 points, they got just 1. A miss on the front end of a one-and-one, a 1-for-2 trip, then a lane violation on the first of a bonus chance preceded a pair of misses with :45.2 left. Along the way, Simeon Watson drilled a 3 for the Hornets that had them back within 7 but those missed opportunities haunted. Had they hit all of those misses, they would’ve been even. The Panthers answered with two free throws by Riddick, then another by Maertens who followed with a layup off a long lob on an inbounds play. That run put the game out of reach, producing a 12-point lead than Croom’s two 3’s merely cut into. “I’m proud of the kids,” said Hornets coach Mike Simmons. “They played hard and they’re playing more solid. If we’d just a made a few more layups right there, a few more free throws, we had a chance to win that ballgame. We’re playing a lot better. We’ve just got to get our offense down a little bit more where we can finish those shots around the goal. The Panthers scored the first 3 points to grab the lead initially. Murray posted up for a basket and, after Riddick scored, added a free throw to make it 5-3. Riddick stepped outside at the other end and knocked down Benton’s only 3 of the game. Maertens added two free throws and it was 10-3. A driving layup by Bryant’s Alex Oneal cut into the lead and when Jaelyn Jones hit the offensive glass for a bucket with :11.5 showing, it was a 3-point game. After Maertens’ run to start the second quarter, Croom hit two free throws and Murray added another but those were the only points the Hornets would manage in the period. They were 0-for-6 from the field. Benton still just led 18-10 at the half. Neither team could make much headway in the third quarter before Croom scored off a drive. Maertens answered but Croom fed Murray for a basket. 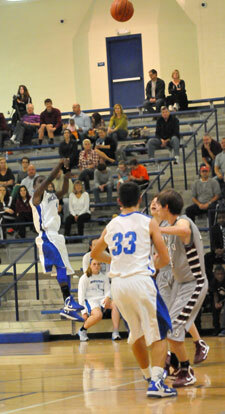 Murray blocked a shot by Riddick, grabbed the rebound and was fouled with 1:47 left in the third quarter. And when he converted his first shot, the Hornets were within 20-15. They had a couple of chances to whittle the margin further but suffered turnovers each time. Baskets by Riddick and Clay Anderson closed out the period with the lead pushed back to 24-15. 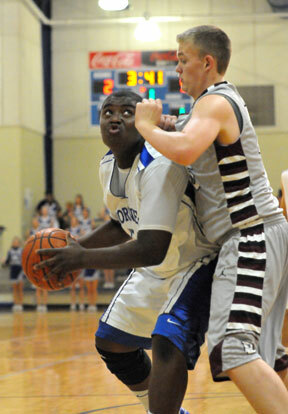 Bryant suffered 22 turnovers in the game against a variety of Benton defenses that included two different presses. Dagan Cardin hit a free throw for the Hornets early in the fourth quarter but Benton answered to go up 26-16 with less than five minutes left in the game. The Hornets got a lift off the bench from Trey Harris who knocked down a 3 and, after a layup by Benton’s Ben Powell, Murray scored inside to make it 28-21. Maertens missed and Murray tacked on a pair of free throws and, with 3:02 to play, the Hornets were down just 28-23 and appeared to have the momentum. That’s when Riddick, posting up on Murray, turned and faked a shot, getting the Bryant postman up in the air. Riddick ducked under and around then hit a short jumper to push the lead back to 7 with 2:34 remaining. Now 2-4 overall and 0-1 in league play, the Hornets return to action on Monday, Nov. 26, at Lake Hamilton, hoping to avenge a loss to the Wolves in the Bryant Invitational Tournament. Anderson 2-4 2-26 6, Maertens 5-15 8-10 18, Powerll 1-4 0-0 2, Riddick 5-11 2-2 13, Norris 0-1 0-1 0, Blalock 0-0 0-0 0, Oulch 1-1 0-0 2, Howe 0-0 0-0 0, White 0-0 0-0 0, Gillion 0-0 0-0 0. Totals 14-36 12-19 41. Three-point field goals: Benton 1-8 (Riddick 1-3, Maertens 0-4, Powell 0-1), Bryant 4-10 (Croom 2-4, Watson 1-2, Harris 1-2, Hunt 0-1, Lee 0-1). Rebounds: Benton 20 (Maertens 5), Bryant 23 (Murray 9). Turnovers: Benton 10, Bryant 22. Team fouls: Benton 18, Bryant 17. Fouled out: Bryant, Watson. Technical fouls: Benton, Anderson; Bryant, Hunt (ejected).